The newer keys that broadcast their signal also allow you to open the door without inserting a key in the lock. On these vehicles there is still a door lock present, but it is hidden by a cover cap over the lock. If your car has a visible keyhole on the door, the chip has nothing to do with opening the lock. Any correctly cut mechanical key will open the door. Most vehicles with a transponder in the key will have a lock symbol on the dash, a light on the dash, or some other sort of indicator showing that the security system is active. When you present the key, this light goes out once the key is recognized. You cannot always tell when there is a chip in the key. Most GM keys look too thin to have a chip, yet they do. Most folks assume that if it is a remote head key (there are remote control functions built in to the actual key) then there is a chip. This is not always the case. Some keys look the same, but their color is what determines the presence of a chip. A good example of this is Chrysler products. 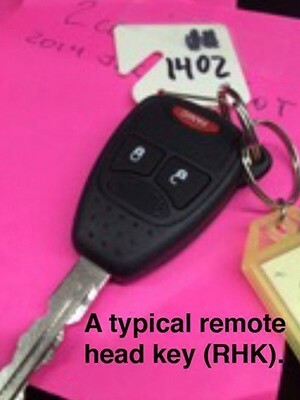 If it’s black (with the exception of remote head keys), it has no chip. If it’s grey or tan, there is a chip in the key. Every vehicle has it’s own way of responding to the chip. Some cars will do absolutely nothing if the lock is turned and the chip is not recognized. Some will crank, but not start because the fuel pump is disabled. Some will start and shut off after a couple of seconds. Part of my job is to look for the indicators that tell me if there is a chip needed for proper operation. Remember that if your car didn’t run before with your original key, making a new key is not going to fix it.